BANGI, 19 August 2014 – Universities in the country were suggested today to emulate The National University of Malaysia (UKM) in making volunteerism and participation in uniformed bodies a priority. Minister of Home Affairs Datuk Seri Dr Zahid Hamidi said the spirit of volunteerism needed to be nurtured in all universities so as to give a strong foundation for graduates to continue participating in volunteer work once they are employed. 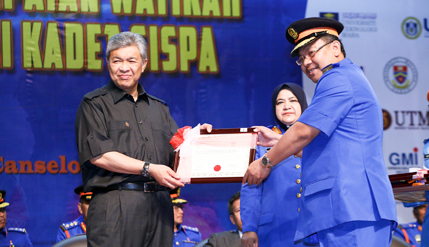 He was speaking at the National Civil Defence (SISPA) cadet accreditation ceremony in the UKM campus here today. A total of 455 cadets from 22 institutions of higher learning in the country were accredited with the rank of 2nd lieutenant. SISPA is a uniformed body consisting of undergraduate volunteers who are trained to deal with natural disasters and critical situations like accidents. They are also trained in rescue operations including fire fighting and on the scene medical treatment. Zahid said he would like to see each public university have the participation of 100 students and at least 50 from each private university in uniformed bodies. The SISPA cadets were accredited after completing a series of training from responding to bomb threats to natural disasters. They are the unsung heroes who work behind the scenes to assist in the protection of the country and the people. They are deployed during natural disasters and are professionally trained to identify, deal and neutralise security threats. Vice Chancellor Prof Datuk Dr Noor Azlan Ghazali who is also the commandant of SISPA UKM said the university is restructuring its uniformed bodies to put them under Pusat Kesatria so that they can be managed more efficiently and are better able to contribute to community development. Director General of Civil Defence, Dato’ Zaitun Abdul Samad, officers from The Ministry of Home Affairs and representatives from other universities attended the ceremony.